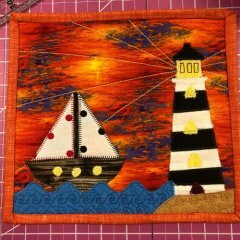 August Mug Rug of the Month - Harbor Sunset! I told you it was awesome, but I might be a little bias being a retired sailor. Come on in and get your kit! We have started a new Coupon and Notification System. In addition to Newsletters we will be sending out various coupons and reminders including a 20% Birthday Coupon! Even if you are already a Newsletter recipient, you will not receive the Birthday Coupon unless you inform us of your Birthday. Come try one of our summer "Open Sew Socials". Happening the first and third Friday, through August. Pick a date and bring a sewing or embroidery machine, a new or unfinished project, and bring a friend or make some new ones. No lingering projects? Not to worry, we have kits, fabrics and ideas for you. Beverages and lite snacks provided, or bring your own if you prefer. This means we are open 3 extra hours for those with a heavy work schedule. Too is 2! Join us for our 2nd Anniversary. Prizes!! Demonstrations!! Food and Fun!! The first 50 customers will receive a special gift! Saturday July 28, 9:00 AM to 3:00 PM. 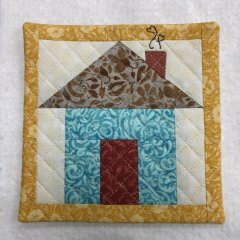 Rocket City Modern Quilt Guild meeting August 21 at 6:00 PM. Come check them out.